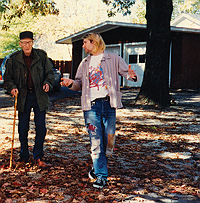 Cobain greatly admired Burroughs, instigating their collaboration on The “Priest” They Called Him and visiting the Beat legend at his home in Lawrence, Kansas. 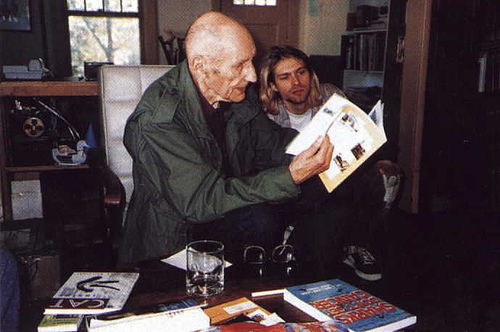 And while Burroughs does not seem to have been especially impressed with the music of Nirvana, he was greatly saddened by Cobain’s suicide. Here is the story. Interviewer: How did you get on with William Burroughs when you recorded together recently? Cobain: That was a long distance recording session. [Laughs] We didn’t actually meet. Interviewer: Did he show a genuine awareness of your music? Cobain: No, we’ve written to one another and we were supposed to talk the other day on the phone, but I fell asleep — they couldn’t wake me up. I don’t know if he respects my music or anything; maybe he’s been through my lyrics and seen some kind of influence from him or something, I don’t know. I hope he likes my lyrics, but I can’t expect someone from a completely different generation to like rock’n’roll — I don’t think he’s ever claimed to be a rock’n’roll lover, y’know. But he’s taught me a lot of things through his books and interviews that I’m really grateful for. I remember him saying in an interview, “These new rock’n’roll kids should just throw away their guitars and listen to something with real soul, like Leadbelly.” I’d never heard about Leadbelly before so I bought a couple of records, and now he turns out to be my absolute favorite of all time in music. I absolutely love it more than any rock’n’roll I ever heard. Interviewer: The song you’ve recorded together makes references to shooting up, and Burroughs’ own history of drug-taking is no secret. Were you worried that this collaboration might throw the spotlight on press rumours that you’ve had considerable experience with hard drugs yourself? 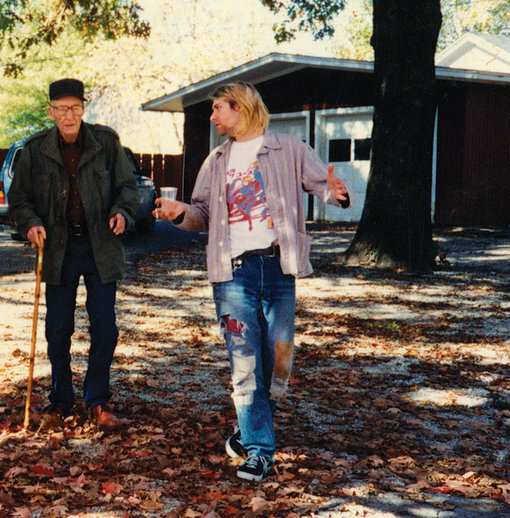 In October 1993 Cobain met in Burroughs in Lawrence, KS. Cobain killed himself on 5 April 1994. A source that wishes to remain anonymous provided these pictures of a painted collage that Burroughs sent to Cobain for his 27th birthday, less than two short months before the singer’s death. Published by RealityStudio on 18 February 2007. 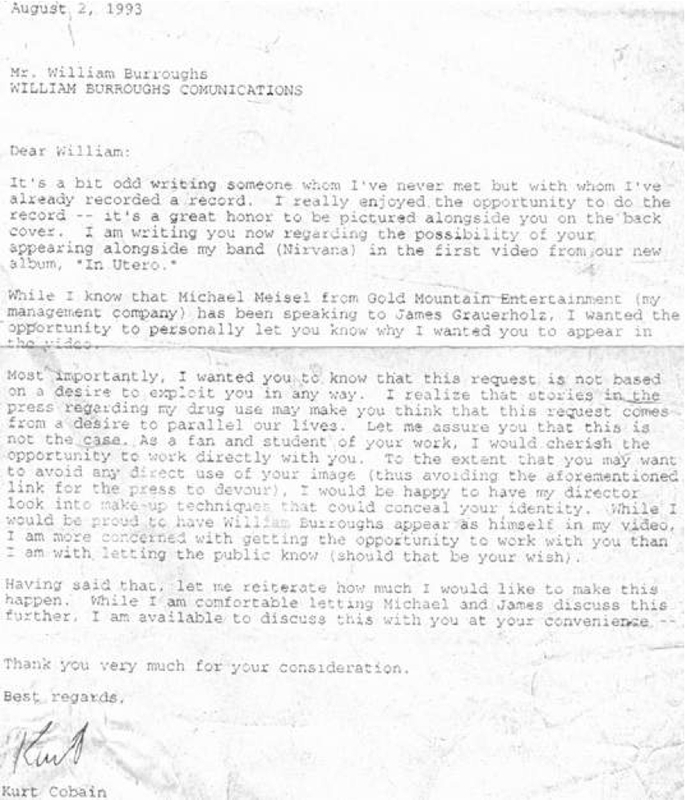 You can download a Russian version of this dossier translated by Boyroid, who also provided a letter that Kurt Cobain sent to Burroughs asking him to appear in a Nirvana video. PreviousThe Day Valerie Solanas Got Her 15 Minutes of Fame.